The contributions of Lud Kading to the design and manufacture of model engines are well known and fairly well documented. An accomplished machinist, Lud started his own machine shop, Kading Specialty Company, in 1943 by borrowing $500 from his then-girlfriend, later to be his wife, Eleanor. Later in 1944, John Brodbeck invested in the company (which was actually no more than a pair of old lathes and some drill presses housed in Lud’s two car garage) to form K&B Manufacturing Company. In 1947, Kading saw an opportunity to take advantage of what was then newly-developed post-war glow plug technology applied to the design of small displacement model engines. Kading believed that there was a potential market for very small model engines, no longer burdened with the weight of an ignition coil, condenser, battery pack and wiring. After his first attempts to build a .010 cubic inch engine were unsuccessful, Kading finally settled on a somewhat larger .020 cubic inch design. The success of the .020 cubic inch engine was due largely to the replacement of the traditional glow plug with a design which incorporated the glow element in an aluminum body which also served as the top of the combustion chamber. Production of the resulting engine, the .020 cubic inch K&B Infant Torpedo, began in mid-December 1948. The engine proved to be an immediate success, with demand for the engine far outstripping the capability of K&B to actually produce the engine. And with the success of the Infant Torpedo, the legend of Lud Kading was firmly established and the rest of the Lud Kading, John Brodbeck, and K&B Manufacturing Company story is now history. But what is not well documented is Lud Kading’s interest in, and contributions to, model car racing. Kading was one of the founding members of the Thermal Thumbers Free Flight club in the Long Beach area of southern California. For several years, the Thermal Thumbers actually held their club meetings in the K&B shop, which was then located in Bell Gardens, CA. It was during this time that Lud Kading first got involved with building and racing gas powered miniature race cars. “I got a little mini car-racing group started in 1949 and 1950. It was mostly for fun. We made up a bunch of little trophies and raced the cars on our shop floor. We would do this about a couple nights a month. It was a fun way to relax and let your imagination run away. “It ended up that we all went over to what we call mini air cars at that time. We tried to keep them all within limits, as far as size, weight, and engine sizes. “At first, we all used Infants, then as we came out with the .035, then the .049, we got some real red-hot cars. “We ran the cars on about a 70-inch wire – so we could easily convert from the 70-foot speed tables. “We finally got the cars going fast enough that they became a blur, so we had to devise a little make-and-brake switch and light that the cars would run over so we could check them with a stopwatch. We did this because several of us ended up with a bunch of little slices across the back of our index fingers. A perfect way to check propeller efficiency. “We finally got these little, approx. 8 inch wheelbase, prop driven pusher cars to approx. 60 mph with the Infants (with a little help from nitrated fuels). The .049 prop driven cars made it up to approx. 80 mph. Not bad for a bunch of homemade toy cars, and also a bunch of adult kids having a lot of fun. In addition to these notes from Lud Kading’s journal, a group of photos appeared in the September, 1949 issue of “Air Trails” magazine showing Lud Kading’s Infant-powered air car which, it was noted, “…holds (the) shop’s race course record of 42.5 mph. Engine hit around 17,000 rpm.” Another photo showed the chassis of another air car, while a third photo showed six different air cars grouped together on the floor of the shop. This was followed by a four-page article entitled “Midget Hot Rod Hits 40 M.P.H.” which appeared in the March, 1950 issue of “Popular Science” magazine. 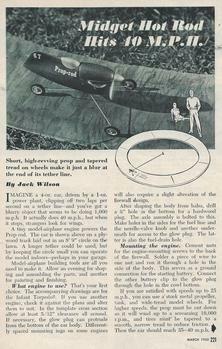 This article included full-size plans and detailed instructions for building an Infant-powered air car. The article was supposedly authored by a Jack Wilson, who was probably a staff writer for “Popular Science”. But, the material for the article unquestionably came from Lud Kading. Interestingly, among race car and model engine collectors, no one had ever seen one of Lud Kading’s air cars and no one knew of any which were still in existence today. A friend had sent me a copy of the September, 1949 “Air Trails” photos, wondering if anyone knew the whereabouts of any of Lud Kading’s cars. And several other collectors had asked the same question. Lud Kading’s race cars were assumed to be lost forever. But that was about to change when a good friend and fellow collector visited our home on his way to a family reunion. Before leaving our house, he gave me a small wood trophy which he had been given by Lud Kading during his last visit with Lud prior to his death. The inscription on the trophy read: “WHEEL DRIVE – INFANT CLASS”. The trophy was consistent with the notes in Kading’s journal where he indicated that: “We made up a bunch of little trophies and raced the cars on our shop floor”. But the inscription on the trophy: “WHEEL DRIVE …” was a mystery. And all of the photos in the September, 1949 “Air Trails” article, as well as the March, 1950 article in “Popular Science” magazine, dealt with propeller-driven cars, not wheel-driven cars. But then, while checking ebay in early August of this past summer, I noted a listing for “Penco Tether Cars” showing a pair of Gad-Jet CO-2 powered cars which were originally produced by Penco Mfg. Co. The two cars listed for sale were unique, however, because they had been converted to gas power using what appeared to be K&B Infant engines. The cars themselves were of some interest to me, so I saved the listing, and checked back near the end of the auction to see if the cars had gotten any bids. It was then that I read a note which the seller had added to the listing near the end of the auction in which he noted that the cars had originally belonged to Lud Kading. The seller indicated that he had purchased Lud Kading’s house and that these two cars were among the cars, boats, planes, model engines, and other items that came along with the property. It was at that instant that I had one of those “AHA! moments”. This ebay listing explained the “WHEEL DRIVE …” inscription on the trophy which my friend had given me. These were two of the wheel-driven cars which had apparently been raced in Lud Kading’s shop. 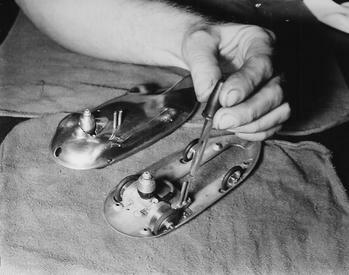 And that was also consistent with the note in Kading’s journal where he said: “It ended up that we all went over to what we called mini air cars at that time.” Apparently, the Thermal Thumbers had initially raced both wheel-driven and propeller-driven cars before eventually transitioning to propeller-driven cars only. Fortunately, I was the successful bidder on the two Lud Kading gas powered GadJet cars listed on ebay. At the conclusion of the ebay auction, I contacted the seller in an effort to find out what else he might have; and, in particular, whether he might have Lud Kading’s Infant-powered air car shown in the photo in the September, 1949 “Air Trails” article. After a lot of digging through Lud Kading’s “stuff”, he came up with not only the Infant-powered air car but also three more trophies, each of which was inscribed: “AIR CAR – INFANT CLASS”. 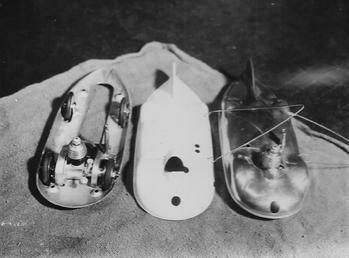 When all was said and done, I ended up with two of Lud Kading’s wheel-driven Gad-Jet race cars; one powered by an .020 cubic inch Infant engine and one powered by a .035 cubic inch Torpedo, Jr. engine, plus a trophy for the Infant-engined car, dated March 16, 1949. And I also obtained Kading’s Infant-powered air car, the “shop floor record holder”, plus three trophies which the car had won, dated March 4, 1949; March 23, 1949; and March 30, 1949. Finally, the mystery of the whereabouts of Lud Kading’s race cars had been solved…thanks to the contributions of the ebay seller and a couple good friends, along with a bit of good, old-fashioned luck. The cars had not been lost. Lud Kading had kept the cars, along with an awfully lot of other good “stuff”. September 1949 issue of "Air Trails" magazine showing Lud Kading's Infant-powered air car plus other air cars which were raced on the shop floor at K&B Manufacturing Co.